Objective: Quercetin is a bioflavonoid noted for its antihistamine release and antiproliferative effects. These properties could theoretically prove beneficial in reversing the inflammatory and proliferative responses in hypertrophic scars. The aim of this study was to evaluate both preventive and curative effect of quercetin on animal model of hypertrophic scars. Materials and Methods: Full thickness four circular excisional wounds were performed on each ear of ten rabbits. Quercetin cream was applied immediately on one wound for four weeks as a preventive treatment and for eight weeks on one hypertrophic scar as a curative treatment. Placebo cream was used for the other two wounds. Results: Clinically, after four weeks, hypertrophic scars were developed in all non-treated and placebo-treated wounds. On the other hand, only 40% of quercetin-treated wounds healed with hypertrophic scars. The level of histamine and hydroxyproline was significantly increased in placebo-treated wounds in the preventive group. However, their levels in quercetin-treated wounds were significantly decreased. In the curative group, after eight weeks treatment with quercetin, only 20% of hypertrophic scars were flattened. While histamine level was significantly decreased in quercetin-treated scars, hydroxyproline level was insignificantly decreased as compared to placebo-treated scars. Conclusion: Due to its antihistamine effect beside its antifibrotic effect, quercetin could be an effective preventive and to lesser extent an adjuvant curative treatment for hypertrophic scars. Excessive dermal scarring in the form of hypertrophic scars and keloids continues to be a clinical problem. Moreover, the functional and aesthetic deformities associated with them remain a significant concern. [2, 3]. Because little is known about the pathophysiology of hypertrophic scarring, an animal model is of great importance as a mean for studying the evolution of a hypertrophic scar from early healing and for evaluating therapeutic modalities. There is growing evidence that mast cells play a fundamental role in tissue homeostasis, remodeling and repair. Mast cells store and release various potent mediators, in particular histamine, proteases, lipid mediators and cytokines through which they can influence different stages of cutaneous wound healing..
Wounding results in adaptive changes in histidine decarboxylase enzyme activity and increases histamine forming capacity.. Increased histamine synthesis was reported in many tissues undergoing rapid growth or repair. Hydroxyproline is an amino acid formed from proline incorporated into collagen and it is a subproduct of collagen synthesis. Tissue hydroxyproline assay presents a parallel increase with tissue collagen level and it is the best indicator of collagen synthesis and wound healing.. The aim of this study was to assess both preventive and curative effect of quercetin on animal model of hypertrophic scars. The study was carried out on ten age-matched healthy white male rabbits, weighing approximately 2 Kg each. Animals were housed under the same controlled environmental conditions at the animal house of the pharmacology department, Alexandria faculty of medicine, fed normal laboratory diet and they had free access to tap water. Animals were anesthetized with thiopental sodium (2.5mg/kg I.V.). Full thickness four circular excisional wounds were performed down to bare cartilage on the ventral surface of each ear by using a 4-mm punch biopsy. A magnifying binocular loupe C 2.3x340mm (Heine, USA) was used. Hemostasis was then obtained by applying pressure. All wounds were covered using an occlusive polyurethane dressing (Tegaderm 3M, Minneapolis, Minn.) until the entire wound appeared re-epithelialized on gross examination. Photographs were obtained and treatment of one of four wounds per ear was begun immediately with quercetin cream three times daily for four weeks. The second wound was treated with placebo cream at the same time to serve as control for the preventive group (n=10). 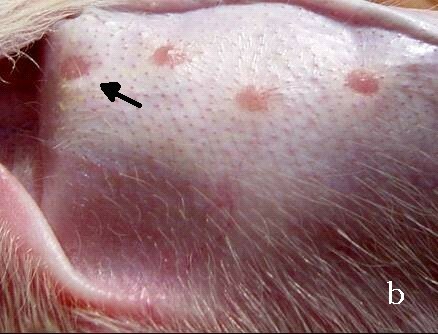 The remaining two wounds per ear remained untreated during this period till a hypertrophic scar was established. After four weeks, treatment of the third wound that developed elevated scar was begun three times per day for eight more weeks. The fourth wound was treated with placebo cream to serve as control group for the curative group (n=10). The ingredients in the cream were modified from the formula according to Katsarou et al. Each 100 gm cream contain: quercetin (Carl Roth, GmbH co. 76185 Karlsruhe, Germany) 7.5 gm, white soft paraffin 9.5 gm, liquid paraffin 4.75 gm, acetyl alcohol 3.5 gm, glyceryl monostearate 2.5 gm, cremophor RH40 4.00gm, methyl paraben 0.25gm, propyl paraben 0.10gm, propylene glycol 10.00gm and water to 100gm. The placebo control was identical in composition except for quercetin. Clinically, after four weeks, hypertrophic scars were developed in all non-treated and placebo-treated wounds. On the other hand, only 40% of quercetin treated wounds healed with hypertrophic scars. In the curative group, after eight weeks treatment with quercetin, 20% of hypertrophic scars were flattened. At the same time, simultaneous reduction in the prominence of the placebo-treated scars occurred in 10% of the scars. (Figure 1). Table1: Effect of quercetin on hydroxyproline and histamine concentration in rabbit’s ear wounded skin (mean + SD). * Significant as compared to placebo-treated group. # Significant as compared to unwounded skin. Hypertrophic scars are abnormal healing responses that develop as a result of an exaggerated proliferation of dermal fibroblasts after skin injury and are characterized by excess accumulation of collagen in the wound.. The development of this abnormal pattern of healing has been associated with an extended period between wounding and re-epithelialization of the wound, resulting in a prolonged inflammatory phase. This may occur as a result of complications such as an infection, a foreign body within the wound, excessive tension on the wound or persistent mobilization of the wound edges. However, in some cases, the pathogenesis of hypertrophic scarring is unknown..
Hypertrophic scars generally appear within four weeks after trauma, enlarge for three to six months, remain static for several months and gradually regress in terms of erythema, size, and irritability over approximately one year[2, 15]. A peak in collagen synthesis at six months is followed by a decrease in synthesis and parallels the clinical changes. In the present work, similar to Saulis group, clinically at four weeks hypertrophic scars were developed in all non-treated and placebo treated wounds. 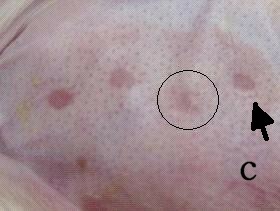 Morris et al ,in the early model of scarring in rabbits, found that these scars tended to decrease in prominence subsequent to day 22, although it has previously been observed in the laboratory that some remain elevated for months. Reduction in the prominence of scars in this study occurred in 10% of placebo treated scars at twelve weeks. During the present study, there was a continuous increase in the amount of collagen measured as hydroxyproline. This result supports the conclusion that the process of scar remodeling including collagen cross linking and active collagen turnover occurs from one month and continues to one year . Moreover, fibrotic conditions such as keloids and hypertrophic scars have excess connective tissue with the collagen being the major contributor. Mast cells are identified in both of these fibrotic conditions and are implicated as a possible contributor to their development and possibly involved in the collagen scar-like organization. They specifically influence granulation tissue organization during wound repair[4, 19]. Rothe et al reported that products of mast cell degranulation (in vitro) are conspicuously implicated in these pivotal events. One such mast cell product, histamine, significantly increased fibroblast proliferation and collagen synthesis[4, 20, 21]. Reich et al observed that immediately after incisional wounding in a domestic pig model, mast cell numbers increased rapidly and subsequently peaked two days after wounding, declined at a relatively constant rate from day two to four and then returned gradually to normal levels at day fourteen. This fluctuation of mast cell numbers and histamine release correlates well with the concomitant formation of granulation tissue, the hallmark of early wound healing. This decline in mast cell number is in contrast to the cellular events seen in hypertrophic scars, in which increased numbers of mast cells persist indefinitely with an associated elevation of tissue histamine. These fibrotic lesions reportedly exhibit as much as 10 to 100 times more mast cells than normal human skin. The results of the present work showed that, after four weeks, the level of histamine in placebo treated wounds was triple the normal level in the preventive group. Moreover, it continued to increase after eight more weeks. Although many articles have been published on the management of hypertrophic scars and keloids, there is no universally accepted treatment protocol. Prevention of them remains the best strategy. Quercetin is a bioflavonoid known to inhibit free radical processes in cells. It is able to protect cutaneous tissue-type cell populations, fibroblasts/keratinocytes and endothelial cells of human origin from cytotoxic oxidative stress induced by protracted depletion of cellular glutathione. In addition, quercetin has been shown to have an anti-inflammatory effect by stabilizing mast cell membranes and inhibit histamine release from basophils and mast cells as well as an antiproliferative effect in both normal and malignant cells of various types[8, 27]. It causes cell cycle arrest and apoptosis[28, 29]. Limiting inflammation is paramount in the control of scar growth and scar-associated symptoms. The anti-inflammatory effect of quercetin, that was previously reported , may be a reasonable explanation of its antifibrotic effect. In the current study, hypertrophic scars developed in less than half of quercetin treated wounds. Inhibition of excess collagen formation could be a consequence of early control of histamine release as a significant decrease in the level of histamine and hydroxyproline was proved in the preventive group of this study. The decrease in histamine, as suggested by Lee et al, was due to inhibition of mast cell degranulation. The antioxidant effect of quercetin might be another explanation for its antifibrotic action. Free radicals are likely to contribute to progressive fibrosis and excessive scar formation in abnormal wound healing. These substances, although important for eliminating infection, can damage surrounding tissue and host cells and initiate further inflammation and pro-inflammatory mediator production. The importance of reactive oxygen species (ROS) in the development of fibrosis is supported by the fact that antioxidants have been shown to be antifibrogenic. [9, 33]. However, the role of ROS in cutaneous scarring remains under investigation. Another possible mechanism for the antifibrotic action of quercetin is its apoptotic effect. It inhibits insulin-like growth factor I, a potent mitogen and inhibitor of apoptosis for cell types. IGF-I has been shown to stimulate fibroblast proliferation and enhances collagen synthesis. In another study , a significant improvement in dermal collagen organization was noted on comparing mederma-treated with untreated scars on rabbit’s ear hypertrophic scar. However, there was no decrease in scar height. They suggested two possibilities, either the conversion of immature to mature collagen is accelerated in some fashion with no net decrease in overall collagen production by fibroblasts or the treatment period of four weeks was too brief to detect a significant decrease in scar hypertrophy. Although the treatment period was extended to eight weeks in the present study with significant reduction in histamine level, flattening occurred only in 20% of hypertrophic scars with insignificant decrease in hydroxyproline level. It seems that early control of inflammatory stage by starting treatment concomitantly with skin incision may decrease or block histamine release and its subsequent stimulation of fibroblast proliferation and excessive collagen synthesis. However, it may not affect collagen breakdown and degradation in mature hypertrophic scars. Furthermore, quercetin concentration may have a role. Lim et al  found that treatment of fibroblasts derived with quercetin in a dose-dependant manner led to a significant inhibition of fibroblast proliferation. In conclusion, due to its anti-histamine effect beside its antifibrotic effect, quercetin could be an effective preventive and to lesser extent adjuvant curative treatment for hypertrophic scars. The authors would like to thank Professor Osama Abdala, professor of pharmaceutics, Alexandria faculty of pharmacy for his assistance in preparing the quercetin cream. 1. Morris D, Wu L, Zhao L, Bolton L, Roth S, Ladin D, Mustoe T. Acute and chronic animal models for excessive dermal scarring: Quantitative studies. Plast Reconstr Surg 1997; 100:674-81. 3. Uppal R, Khan U, Kakar S, Talas G, McGrouther A. The effects of a single dose of 5-fluorouracil on keloid scars: A clinical trial of timed wound irrigation after extralesional excision. Plas Reconst Surg 2001; 108:1218-24. 4. Artuc M, Steckelings M, Henz B. Mast cell-fibroblast interactions: Human mast cells as source and inducers of fibroblast and epithelial growth factors. J Invest Dermatol 2002; 118:391-5. 5. Fitzpatrick D, Fisher H. Histamine synthesis, imidazole dipeptides and wound healing. Surgery 1982; 91:430-4.-8. 6. Singer A, Clark R. Cutaneous wound healing. N Engl J Med 1999; 341:738-46. 7. Kahlson G, Nilsson K, Rosengren E, Zenderfeldt B. Wound healing as dependent on the rate of histamine formation. Lancet 1960; 2: 230-4. 8. Saulis, Alexandrina S, Mogford, Jon H, Mustoe, Thomas A. Effect of Mederma on hypertrophic scarring in the rabbit ear model. Plast Reconstr Surg 2002; 110:177-83. 9. Katsarou A, Davoy E, Xenos K, Armenaka M, Theoharides T. Effect of an antioxidant (quercetin) on sodiumlauryl-sulfate-induced skin irritation. Contact Dermatitis 2000; 42:85–9. 10. Cheng P. An improved method for the determination of hydroxyproline in rat skin. J Invest Dermatol 1969; 53:112-5. 11. Shore P, Burkhalter A, Cohn V. A method for fluorometric assay of histamine in tissues. J Pharmcol Exp Ther 1959; 127:182-6. 12. Hill B. Principles of medical statistics, 9th ed. London. Lancet limited publication 1971, 147; 383-6. 13. Saray Y, Güleç A. Treatment of keloids and hypertrophic scars with dermojet injections of bleomycin. J European Acad Dermatol Venereol 2003; 17:150-1. 14. Clark R. Basics of cutaneous wound repair. J Dermatol Surg Oncol 1993; 19:693-706. 15. Muir I. On the nature of keloid and hypertrophic scars. Br J Plast Surg 1990; 43: 61-9. 16. Sahl W, Clever H. Cutaneous scars: Part I. Int J Dermatol 1994; 33:681-91. 17. Alster T, Tanzi E. Hypertrophic scars and keloids: etiology and management. Am J Clin Dermatol 2003; 4: 235-43. 18. Rahban S, Garner W. Fibroproliferative scars. Clin Plast Surg 2003; 30:77-89. 19. Moyer K, Saggers G, Ehrlich P. Mast cells promote fibroblast populated collagen lattice contraction through gap junction intercellular communication. Wound Repair Regen 2004; 12:269-75. 20. Rothe M, Nowalk M, Kerdel F. The mast cell in health and disease: A greater role. J Am Acad Dermatol 1990; 23:615-24. 21. Garbuzenko E, Nagler A, Pickholtz D, Gillery P, Reich R, Maquart F, Levi-Schaffer F. Human mast cells stimulate fibroblast proliferation, collagen synthesis and lattice contraction: A direct role for mast cells in skin fibrosis. Clin Exp Allergy 2002; 32:237-46. 22. Reich J, Cazzaniga A, Mertz P, Kerdel F, Eaglstein W. The effect of electrical stimulation on the number of mast cells in healing wounds. J Am Acad Dermatol 1991; 25:40-6. 23. Sasaki A, Mueller R, Xi G, Sipe R, Buck D, Hollinger J. Mast cells: An unexpected finding in the modulation of cutaneous wound repair by charged beads. Plast Reconstr Surg 2003; 14: 1446-53. 24. Hermes B, Feldmann-B?ddeker I, Welker P, Algermissen B, Steckelings M, Grabbe J, Henz B. Altered expression of mast cell chymase and tryptase and of c-kit in human cutaneous scar tissue. J Invest Dermatol 2000; 114:51-5. 25. Tharp M. The mast cell and its role in human cutaneous diseases. Prog Dermatol 1987; 21:1-5. 26. Skaper S, Fabris M, Ferrari V, Carbonare M, Leon A. Quercetin protects cutaneous tissue-associated cell types including sensory neurons from oxidative stress induced by glutathione depletion: Cooperative effects of ascorbic acid. Free Radical Biol Med 1997; 22:669-78. 27. Alexandrakis M, Singh L, Boucher W, Letourneau R, Theofilopoulos P, Theoharides T C. Differential effect of flavonoids on inhibition of secretion and accumulation of secretory granules in rat basophilic leukemia cells. Int J Immunopharmacol 1999; 21:379-90. 28. Yoshida M, Yamamoto M, Nikaido T. Quercetin arrests human leukemic T-cells in late G1 phase of the cell cycle. Cancer Res 1992; 52:6676–81. 29. Wei Y, Zhao X, Kariya Y. Induction of apoptosis by quercetin: involvement of heat shock protein. Cancer Res 1994; 54:4952–7. 30. Danielson J, Walter R. Salicylic acid may be useful in limiting scar formation. Plast Reconstr Surg 2004; 114:1359-61. 31. Taguchi K, Hagiwara Y, Kajiyama K, Suzuki Y. Pharmacological studies of Houttuyniae herba: The anti-inflammatory effect of quercetin. Yakugaku Zasshi 1993; 113:327-33. 32. Lee E, Choi E, Cheong H, Kim Y, Ryu S, Kim K. Anti-allergic actions of the leaves of Castanea crenata and isolation of an active component responsible for the inhibition of mast cell degranulation. Arch Pharm Res 1999; 22: 320-3. 33. Phan T, Sun L, Bay B, Chan S, Lee S. Dietary compounds inhibit proliferation and contraction of keloid and hypertrophic scar-derived fibroblasts in vitro: Therapeutic implication for excessive scarring. J trauma 2003; 54: 1212-24. 34. Phan T, See P, Tran E, Nguyen T, Chan S, Lee S. Suppression of keloid derived fibroblasts by quercetin: its therapeutic potential use in the pathway and collagen insulin-like growth factor signaling expression in treatment and /or prevention of keloids. Br J Dermatol 2003; 148:544–52. 35. Lim I, Phan T, Lee S, Huynh T, Longaker M. Quercetin inhibits keloid and hypertrophic scar fibroblast proliferation and collagen production. ANZ J Surg 2003; 73:286.